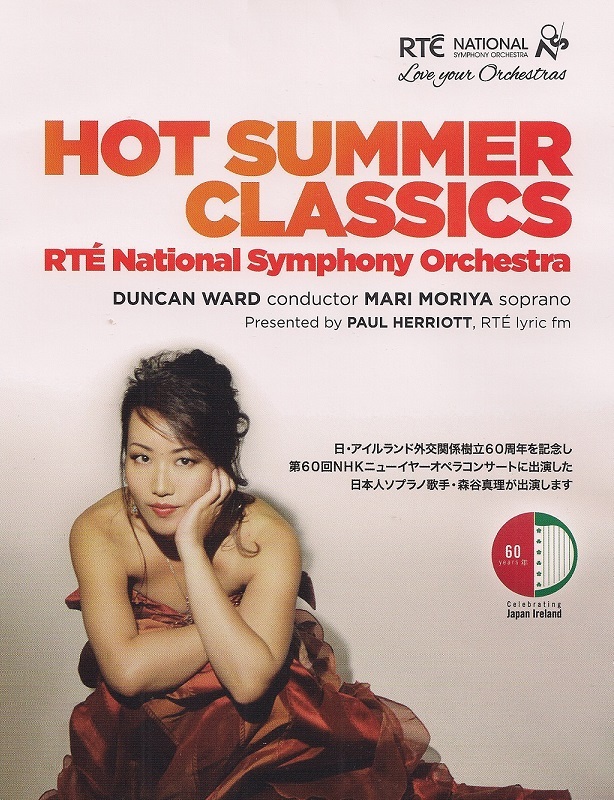 Start your summer with colourful, sun-drenched classical favourites and a performance which, with the presence of Japanese soprano Mari Moriya, celebrates the 60th anniversary of the establishment of diplomatic relations between Japan and Ireland. Scorching Spanish vitality and heat abound in Turina’s lively gypsy parade La procesión del Rocío, Debussy’s sweltering Ibéria, Ravel’s playful rendering of a jester’s song, Alborada del gracioso and Albéniz’s colourful celebration of Navarra. With the ‘sumptuous-voiced’ (Opera) soprano and 2007 Veronica Dunne International Vocal Competition winner Mari Moriya, sink into the luxurious melodies of Canteloube’s Songs of the Auvergne and the haunting beauty of Villa-Lobos’ Bachianas Brasileira No.5. Gershwin’s Cuban Overture is a bravura rumba brimming over with bristling energy. Soprano Mari Moriya’s association with Ireland began in 2007, when she won the 5th Veronica Dunne International Singing Competition. Her very successful European début followed later that year with Opera Ireland, as Liù in Turandot, and she returned to Opera Ireland for critically acclaimed performances as Zerbinetta in Ariadne auf Naxos (2008) and Zerlina in Don Giovanni (2009). Ms Moriya began her professional career in 2006 and that year made her Metropolitan Opera début as Queen of the Night under the baton of James Levine. This is a role she has sung in numerous productions: for OperLeipzig, Glyndebourne on Tour, Seattle Opera, Volksoper Wien, Baltimore Opera, Pittsburgh Opera and Scottish Opera, to name only some. Ms Moriya studied at the Musashino Academy of Music in her native Japan and the Mannes College of Music, New York. She was a Grand Finalist in the Metropolitan Opera National Council Auditions 2005. Among numerous awards, she received the 2007 Cardiff Singer of the World Concert Prize.